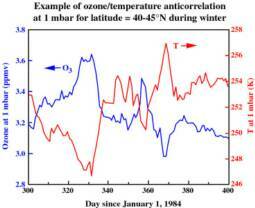 Because there was so much water vapor in the air when television came over the airwaves in 1946/47 broadcasting above the 2nd gyroharmonic calming the electron precipitation (NO2 production and ozone depletion) the temperature dropped as quickly as the ozone layer could repair itself. With all the moisture in the air it began to rain and snow! Below are reports matching this event. Warning - If we turn down AM broadcast near gyro frequency...do it gradually! O - zone is a fragile molecule and is easily bullied around by other chemical reactions. It is an allotrope of oxygen that is much less stable than the diatomic species O2 and is the second most powerful oxidizing agent and is unstable in high concentrations decaying to ordinary diatomic oxygen. Being an allotrope it has the ability to catenate and form covalent bonds with it self which makes it very sensitive to it’s electro-negativity. 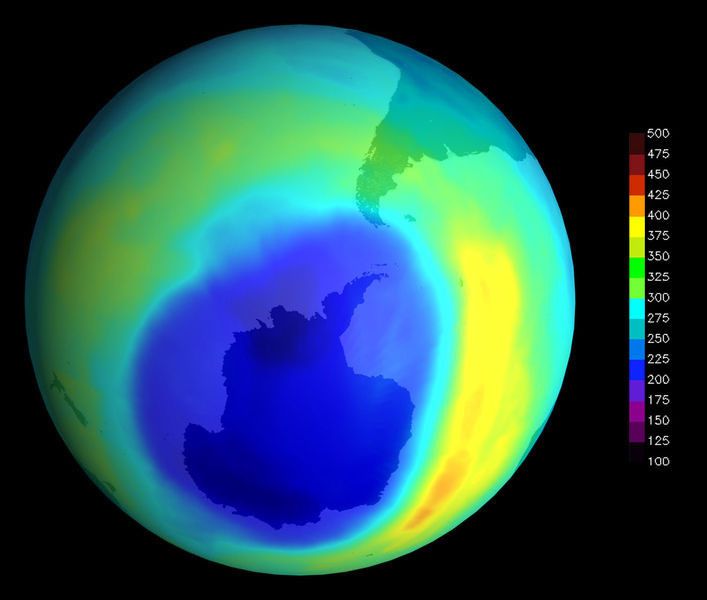 The highest levels of ozone are in the ozone layer between 10 – 50km where it blocks out the suns ultraviolet light. 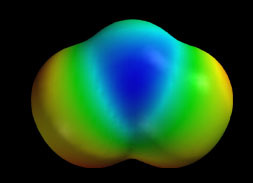 This fragile molecule is ripped apart in the presence of free radicals of which the most important are hydroxyl(OH), nitric oxide(NO) and chlorine(Cl) and bromine(Br) In recent decades the ozone layer has been depleted due to the reactions with CFC’s on a seasonal basis and just as much by electron precipitation, yet on a constant basis. 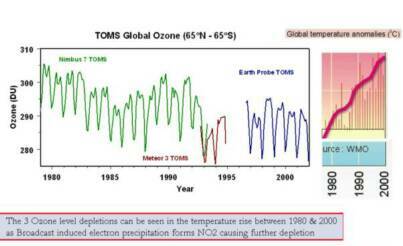 The connection between temperature and ozone levels is evident in these text book examples below. Ozone depletion describes two distinct, but related observations: a slow, steady decline of about 4 percent per decade in the total amount of ozone in Earth's stratosphere since around 1980; and a much larger, but seasonal, decrease in stratospheric ozone over Earth's polar regions during the same period. The latter phenomenon is commonly referred to as the ozone hole which are formed due to particle precipitation from CFC's, solar proton events and electron precipitation that funnels into the polar vortex. "The domino-like effect began in October and November 2003, when the Sun unleashed a record barrage of radiation and charged particles toward Earth. The planet's magnetic field funneled some of the storm's electrons into the upper atmosphere above the poles. The electrons hit nitrogen molecules there, breaking some of them into nitrogen ions. 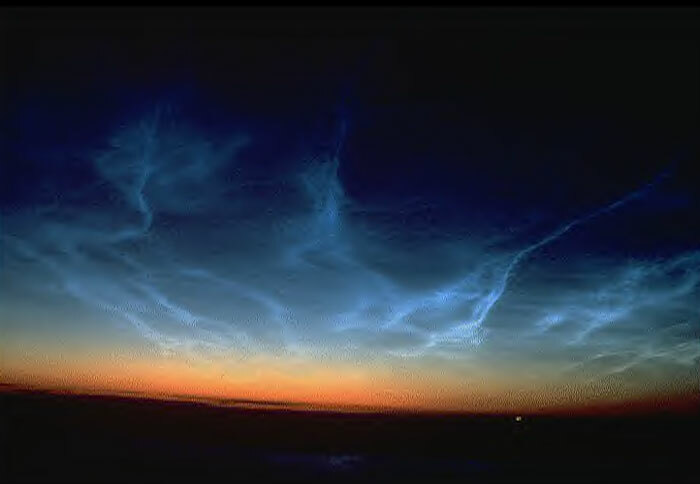 Those reactive atoms then combined with nearby oxygen molecules to form molecules of (NO) nitrogen oxide - levels of which rose in November and December 2003, according to the satellite data. Electron precipitation from broadcast radio occurs in the same manner and although this is a dramatic example of this kind of ozone depletion it was found that ozone depletion over all hadn’t crept up over night. In fact NASA was criticized for not recognizing it earlier because the ozone layer had been diminishing slowly and gradually for quite a while with estimates going back at least till1976. How about since 1909? When radio broadcast first came over the airwaves? One of them is the runaway population of electrons and ions from the ionosphere caused by the effects of the powerful HF radio wave. The other is the population of electrons that precipitate from the magnetosphere. It is shown that the hydrodynamical equilibrium was disrupted due to the effects of the HF pumping." Through the experiments at HAARP researchers found that pumping radio waves into the atmosphere changed the hydrodynamical equilibrium through electron precipitation. Because ozone is such a fragile molecule and relies on covalent bonds any disruption to the local electronegativity will alter the chemical reactions. In 1947 the UK was recovering from the trauma of the war years and could have done without the problems of dealing with one of the most severe winters on record. Two relatively short spells of cold weather - one in December 1946, the other in early January 1947 - led to the 'main event' which persisted from 21 January to 16 March. Bringing about the start of the third cold spell was an anticyclone that became anchored over Scandinavia around 20 January. This blocked the eastward progress of Atlantic depressions and forced them to take routes south of the UK. The result was that easterly winds set in, bringing snow first to eastern and south-east England before extending across much of the country. On 30 January the Isles of Scilly were lying under about 18cm of snow - an extraordinary sight. Intensely cold conditions affected much of England and Wales in the final week of January - on the morning of the 30th the temperature at Writtle (Essex) was -20 °C. Over the month as a whole, the highest temperature for England and Wales was around 14 °C, and the minimum was a numbing -21 °C. Easterly winds persisted throughout February, with only brief breaks in the cold snowy weather. On no day did the temperature at Kew Observatory top 5 °C, and only twice in the month was the night minimum temperature above freezing. It was the coldest February on record in many places and, for its combination of low temperatures with heavy snow, bore comparison with January 1814. In some parts of the country, snow fell on 26 days. It was often light and powdery so it was easily whipped up into deep drifts that affected roads and the railway network. New ways were tried in order to clear them. One method was to mount jet-turbine engines on towed trailers and angle the hot-air outflow of the engines towards the ground; these were hugely effective in clearing the snow from roads but the underlying surface melted too, so the experiment was rather short-lived! In the early days of the radio broadcast boom, more and more transmitters were being built pumping the ionosphere with a greater amount of frequencies in the range of the gyrofrequency. As the temperature slowly crept up it wasn’t until 1946 that the rise in temperature took it’s first dip. In 1946/47 the largest shift in frequency ERP occurred in the northern hemisphere. The FCC reallocated long-wave FM broadcast to higher frequencies upon the recommendation of FCC engineer Kenneth Norton, who, combined WWII skywave propagation results from the War Department, data from the Bureau of Standards and measurements from FM radio station WGTR in Paxton. He determined that propagation in the LW FM band would cause a great deal of interference due to it’s interaction with the E and F layers of the ionosphere. During this time a television broadcast boom came over the airwaves and the UK resumed LW FM range television transmission after the war, causing a major shift in the electron density of the polar region from pushing the frequency in our ionosphere between the 1st and 2nd gyroharmonics of the cyclotron resonance causing the electron precipitation to calm and the pressure systems to alter. The UK broadcast television incurred massive tropospheric ducting and the signals were received all over the world. 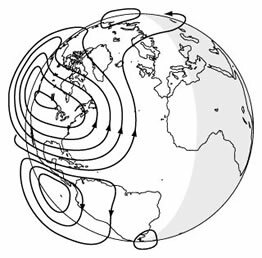 Tropospheric propagated signals travel in the part of the atmosphere adjacent to the surface and extending to some 25,000 feet (7,620 meters). Such signals are thus directly affected by weather conditions extending over some hundreds of miles. During very settled, warm anticyclonic weather (i.e., high pressure), usually weak, snowy TV signals from distant transmitters improve in signal strength. A settled high-pressure system gives the classic conditions for enhanced tropospheric propagation, in particular favoring signals which travel along the prevailing isobar pattern rather than across it. Such weather conditions can occur at any time, but generally the summer and autumn months are the best periods. In certain favorable locations, enhanced tropospheric propagation may enable reception of UHF TV signals up to 1,000 miles (1,600 km) or more. Two months later as winter came the weather shifted dramatically! The temperature dropped and freak snow storms ravaged parts of the United States and Europe. This was one of the strangest storms in history and it began with an anticyclone that centered in central Scandinavia. 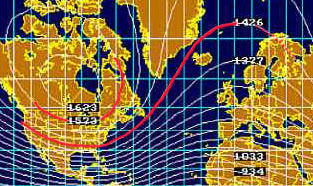 If you look at the ionospheric diurnal flows you can see not only how the anticyclone might have resulted from the shift in it’s gyrofrequency, but you can see the path with which our broadcast frequencies could effect the weather as it travels from the lower latitude United States up toward the higher latitudes across the Atlantic ocean effecting Europe and Scandinavia. A notable feature of February 1947 was dry conditions in parts of western Scotland. Because of the persistent anticyclonic conditions, some places that were normally very wet had no rain at all. A completely dry month in western Scotland is unusual, and was unprecedented for February. Another unusual feature was cloudiness in the Midlands and south of England - a complete contrast to the north-west of Scotland, where the weather was unusually sunny. At Kew, Nottingham and Edgbaston, there was no sun on 22 days and, at Kew, there was none at all from the 2nd to the 22nd. Most places in the Midlands and southern England recorded sunshine totals less than half the average. When skies did clear, night-time temperatures plunged. A minimum of -21 °C was recorded at Woburn in Bedfordshire early on the 25th. Without the cloud, the month would almost certainly have been even colder than it was, certainly at night. If February hadn't been enough, March proved to be even worse. In the first half of the month, there were more gales and heavy snowstorms. On 4 and 5 March, heavy snow fell over most of England and Wales, with severe drifting. On 6 March, drifts were five meters deep in the Pennines and three meters in the Chilterns. In some places, glazed frost occurred. On 10 and 11 March, southern Scotland had its heaviest snowfall of the winter and, on the 12th the Scottish Highlands reported drifts more than seven metres deep. Meanwhile, mild air with a temperature of 7-10 °C edged into the extreme south-west of the UK on 10 March, bringing rain. The ensuing thaw was rapid - by the evening of the 11th, vast areas of southern England were under water. After weeks of frost, the ground was frozen hard. The rain and meltwater couldn't soak into the ground - surface run-off was its only option. The warm air spread northwards and eastwards. Meltwater from the Welsh mountains poured into the valleys of the Severn and Wye, flooding Herefordshire and Gloucestershire. The rivers of the English Midlands burst their banks and, by 13 March, Fenland rivers were close to overspill. On the 15th, a deepening depression from the Atlantic approached the UK, bringing rain and severe gales. During the afternoon of the next day, mean winds over southern England reached 50 knots, with gusts of 80-90 knots. Buildings were damaged and waves were whipped up on floodwaters. In East Anglia, where the major rivers flow north-eastwards, the south-westerly wind drove their waters ahead and waves pounded the dykes. Water levels rose, the dykes were breached and most of Fenland was inundated. Troops were called in, but could do little to stop water racing through the breaches. River levels rose relentlessly. For example, the Trent burst its banks at Nottingham on 18 March, flooding hundreds of homes - many to first floor level. When floodwater reached the tidal part of the Trent, it was impeded by a spring tide, and the whole of the lower Trent valley was flooded.The floods in the West Country subsided after the 20th, but rivers continued to rise in eastern England. The Wharfe, Derwent, Aire and Ouse all burst their banks and flooded a huge area of southern Yorkshire. Selby was almost completely under water, only the ancient abbey and a few streets around the market place escaped inundation. Seventy per cent of all houses in the town were flooded. The cold and snowy weather had, at last ended, but the misery of the floods continued into the spring. And to make matters worse, the severe difficulties caused by the winter of 1947 were aggravated by the fuel and food shortages that remained after World War II. xt. Water vapor in the atmosphere absorbs the solar radiation and causes the temperature to rise. In 1946/47 there was an abundant amount of water vapor into the air and after television came on this calmed electron precipitation and when the ozone layer began to repair itself all the water vapor in the air condensed as the temperature dropped and the weather was greatly affected. There are four basic points that must be understood to have a clear picture of how the path of energy relates to Broadcast Theory. 1. Electron precipitation creates NO2 and OH which deplete the stratospheric ozone. 2. Electron precipitation disrupt the hydrodynamic equilibrium and increases the electron density which lowers the atmospheric electronegativity, both of which the ozone relies on in its creation process. 3. 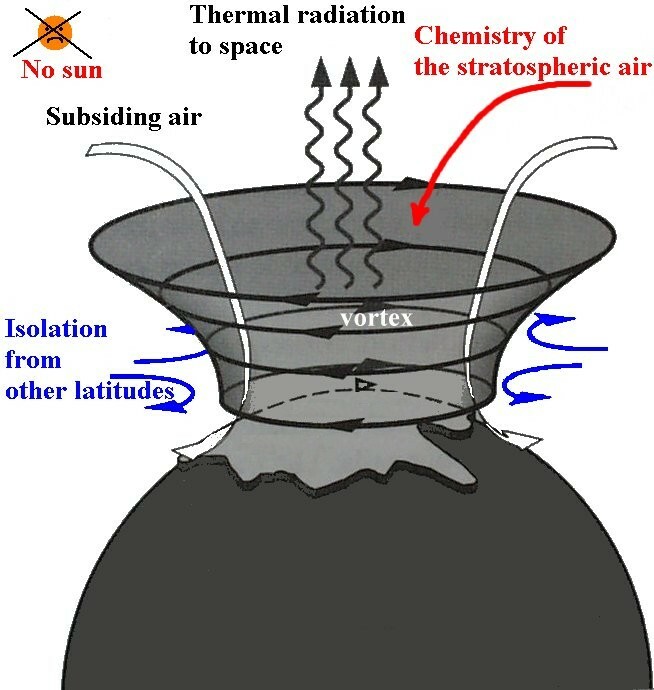 The effects of ozone depletion increases incoming solar radiation and causes evaporation of ocean water into vapor that acts as the most abundant source of heat in the greenhouse effect. 4. Broadcast television clamps the ion acoustic turbulence resulting in the reduction in the greenhouse effect. This can be seen in the global temperature graph as well as weather reports and ocean oscillation cycles. The latter reaction is catalyzed by the presence of certain free radicals, of which the most important are hydroxyl (OH), nitric oxide (NO) and atomic chlorine (Cl) and bromine (Br). The amount of ozone in the stratosphere has been declining due to three major factors. One is the emissions of CFCs and similar chlorinated and brominated organic molecules, which have increased the concentration of ozone-depleting catalysts above the natural background. Although we banned them 17 years ago and the CFCs leveled out 7 years ago the ozone holes were the largest ever in October 2006. The other two forms of ozone depletion come in the form of solar proton events and particle showers that flow from the ionosphere and the magnetosphere. Power Line Harmonic Radiation (PLHR) as well as broadcast radiation from the radio, television, and telecom industry interact with the magnetosphere and ionosphere which cause these particles to rain down. The planet's magnetic field funnels the electrons into the upper atmosphere above the poles. The electrons hit nitrogen molecules there, breaking some of them into nitrogen ions. Those reactive atoms then combined with nearby oxygen molecules to form molecules of (NO) nitrogen. Finally, downward-blowing winds in a polar vortex above the Arctic pushed these molecules of NO2 and OH into the stratosphere. There, each nitrogen oxide and hydroxyl molecule could rip apart hundreds of ozone molecules, just as CFCs do. 2. Although the polar regions are generally considered the most tenuous regions of the atmosphere the electron precipitation increases the electron density and peaks and the polar cap which disrupts the hydro dynamic equilibrium and lowers the atmospheric electro-negativity both of which ozone relies on in it’s creation as it takes a certain amount of activation energy for the chemical reactions to function properly. 3. 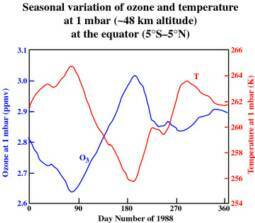 Ozone depletion describes two distinct, but related observations: a slow, steady decline of about 4 percent per decade in the total amount of ozone in Earth's stratosphere since around 1980; and a much larger, but seasonal, decrease in stratospheric ozone over Earth's polar regions during the same period. The latter phenomenon is commonly referred to as the ozone hole. As the ozone layer becomes thinner it blocks less and less of the solar radiation allowing the solar energy to heat the ocean water causing it to evaporate into the atmosphere. The increase in water vapor then acts as a greenhouse gas. Water vapor is the most powerful greenhouse gas and is the most abundant of all the greenhouse gasses in the air. 4. As the temperature slowly crept up it wasn’t until 1946 that the rise in temperature took its first dip. In 1946/47 the largest shift in frequency ERP occurred in the northern hemisphere. The FCC reallocated long-wave FM broadcast to higher frequencies upon the recommendation of FCC engineer Kenneth Norton, who, combined WWII skywave propagation results from the War Department, data from the Bureau of Standards and measurements from FM radio station WGTR in Paxton. He determined that propagation in the LW FM band would cause a great deal of interference due to it’s interaction with the E and F layers of the ionosphere. During this time a television broadcast boom came over the airwaves and the UK resumed television transmission after the war, broadcasting on multiples of the gyroharmonic above the second which causing a major shift in the electron density of the polar region, pressure systems to alter and the electron precipitation to calm. As the ozone layer began to repair itself and the temperature dropped all the water vapor that had been building in the atmosphere up until this time now began to condense causing rain and freak snow storms ravaged parts of the United States and Europe. This was one of the strangest storms in history and it began with an anticyclone that centered in central Scandinavia. The UK broadcast television incurred massive tropospheric ducting and the signals were received all over the world. “Tropospheric propagated signals travel in the part of the atmosphere adjacent to the surface and extending to some 25,000 feet (7,620 meters). Such signals are thus directly affected by weather conditions extending over some hundreds of miles. During very settled, warm anticyclonic weather (i.e., high pressure), usually weak, snowy TV signals from distant transmitters improve in signal strength. Notice that the gyrofrequency path is right over Greenland's ice sheets which are melting quickly! 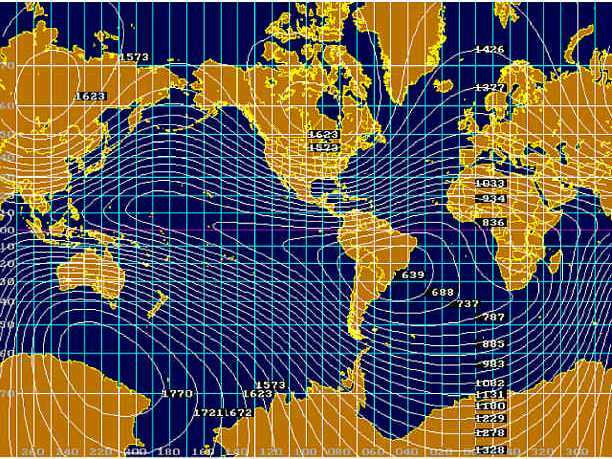 The broadcast gyrofrequency fuels the aurora electrojet and the electron density in the polar cap region. 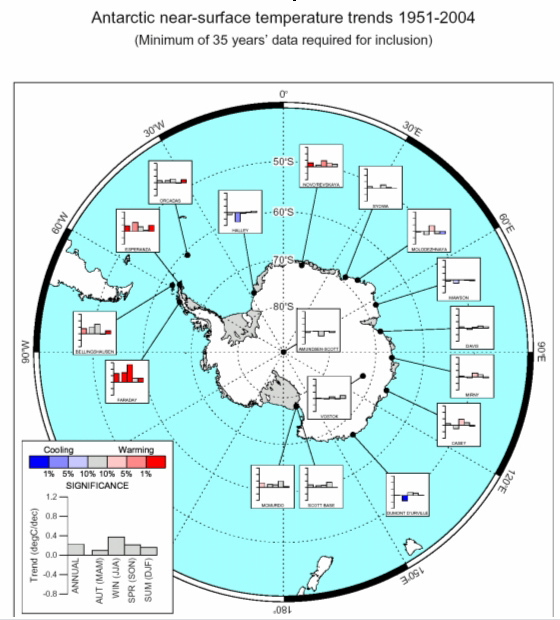 1.Both experimental and model studies of long-term climate changes above Antarctica continent indicate presence of strong climate warming at the region around the Antarctic peninsula which differs significantly from the climate tendency in other parts of Antarctica. This warming is the most intense on the Earth together with similar regions of warming located in Alaska and in North-East Siberia. Another climatic anomaly in this region is a giant spot of the open water (polynya) which does not freeze in wintertime. Up to now all attempts to explain these phenomena by the traditional meteorological factors turned out to be inadequate. 2. 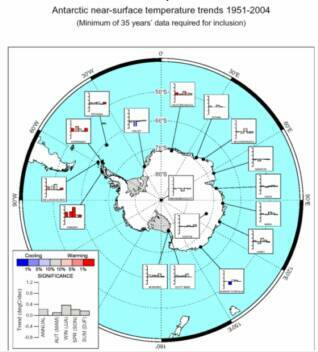 It is shown in this paper that the region of intense global warming around Antarctic peninsula precisely coincides with a stable maximum of energetic electron precipitation (E > 1 MeV) from the Earth radiation belt. Depth of penetration of these particles into atmosphere could be as low as 20-40 km. 3. Energetic resources of this phenomenon are quite sufficient in order to supply input of thermal energy capable to warm atmosphere in this region. 4. Further study of interaction between the auroral and mid-latitude atmospheres during geomagnetic storms and superstorms is an important part of the solar-terrestrial physics. There are a lot of things to be done in this direction. Here we show, using observations from three different satellite instruments, that EEP events strongly affect ozone at 60–80 km, leading to extremely large (up to 90%) short-term ozone depletion. This impact is comparable to that of large, but much less frequent, solar proton events. 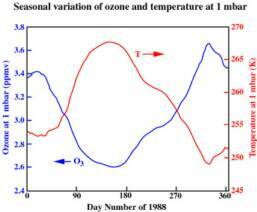 On solar cycle timescales, we find that EEP causes ozone variations of up to 34% at 70–80 km. 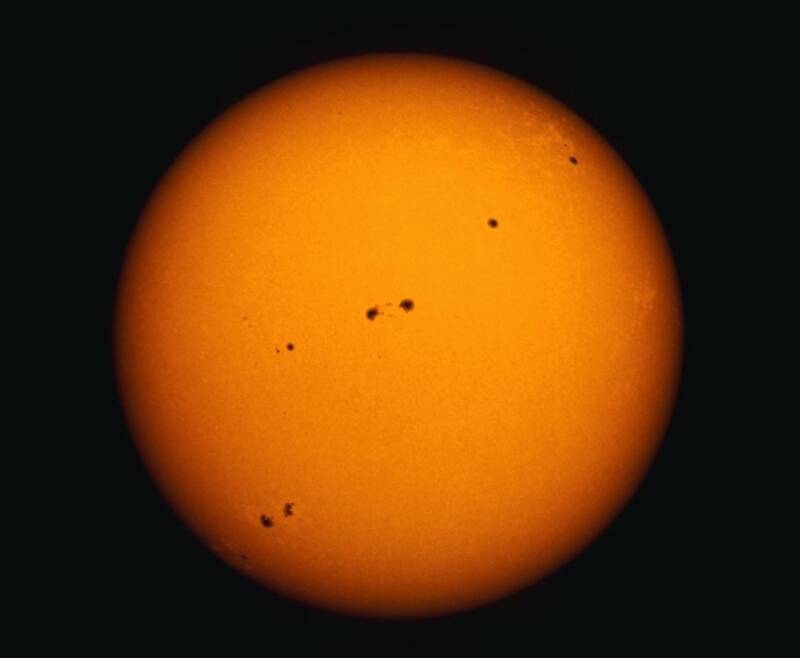 With such a magnitude, it is reasonable to suspect that EEP could be an important part of solar influence on the atmosphere and climate system. Up to half of the NOx in the mid‐stratospheric SH polar vortex may be due to particle precipitation. Summary: Nitrous oxide has now become the largest ozone-depleting substance emitted through human activities, and is expected to remain the largest throughout the 21st century, scientists report in a new study.